The domestic RHI launched on the 9th of April, 2014. By the end of August, stats released by DECC show an impressive total of 7,485 accreditations across all technologies and 9,963 applications. The vast majority of the applications and accreditations are legacy applicants. That is, systems that were installed before the launch of the scheme on April 9th, 2014. The overall application numbers show a lot of activity under the scheme. With such a high proportion being legacy applicants however, it is important not to confuse activity under the scheme with current installation activity. The overall numbers give us a picture of renewable heat installations over the last few years. For recent activity, we need to isolate the new installation numbers. There have been 1,611 applications for systems installed since the launch of the scheme. That’s around 16.2% of applications meaning that 83.8% of applications have been for legacy systems. 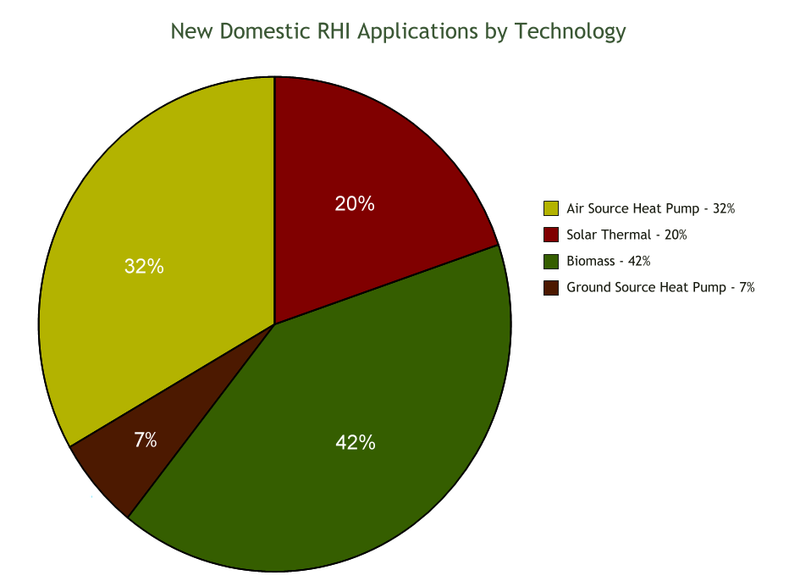 It is still very early days for the Domestic RHI but new application numbers give us an indication about how popular renewable heat is right now and which technologies are being installed. The market has been waiting for the Domestic Renewable Heat Incentive for some time now and the clear hope is that the Domestic RHI can stimulate growth in renewable heat. This is our second Renewable Heat Update and takes in installation figures for the Domestic RHI up to the end of August. New installation numbers give us an indication of activity levels under the scheme and the uptake of the various renewable heating technologies. New applications continue to increase month by month. As noted in the previous update, we shouldn’t confuse impressive application numbers from the Domestic RHI with activity levels in the domestic renewable heat market. Of 9,963 applications to date, 83.8% of those (8,352) are legacy applications for installations pre-dating the launch of the scheme. Only 1,611 of the applications represent new installs. The Domestic Renewable Heat Incentive is in its very early days and we have limited data, covering slightly less than 5 months. New applications have so far been increasing month by month and this has continued in August. From launch on April 9th until May 31st there were only 203 applications for new installations. The month of June saw a further 379, July 464, and in August new installation numbers increased again to 565. In July and August, activity levels under the Domestic RHI have grown to levels that are above the monthly average over the last few years under the RHPP. 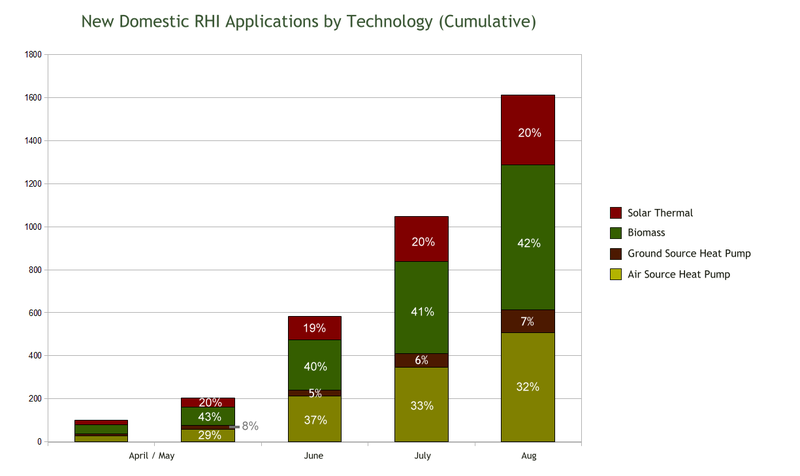 Over the course of the RHPP there were an average of 427 installs per month across all technologies. If new installation numbers under the Domestic RHI continue to grow, it would suggest that the scheme is succeeding in stimulating the move to renewable heat for domestic users. The extent of this growth remains to be seen and will become more evident in the coming months. When we look at new applications, the technology mix is considerably different from the technology mix of legacy applications. 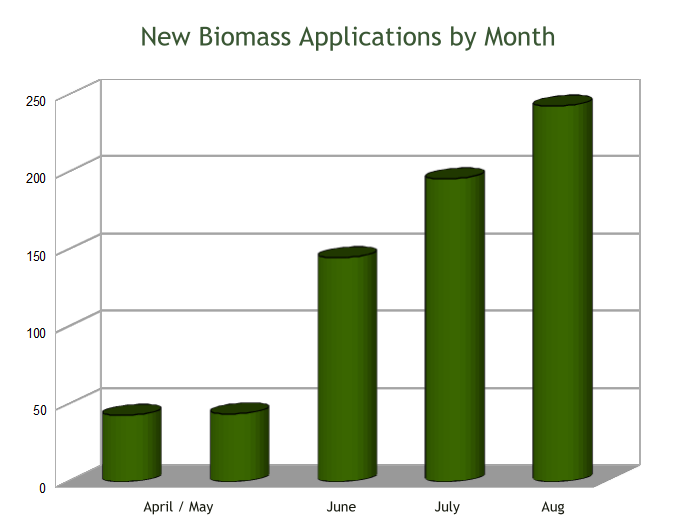 Biomass accounts for the largest share of new applications at 42%. This represents a considerable upswing over previous years. Biomass accounts for only 17% of the applications for legacy installations under the Domestic RHI. Under the RHPP (August 2011 until March 31st 2014), biomass accounted for only 16% of installs. Early indications therefore are that the Domestic RHI is good news for biomass. 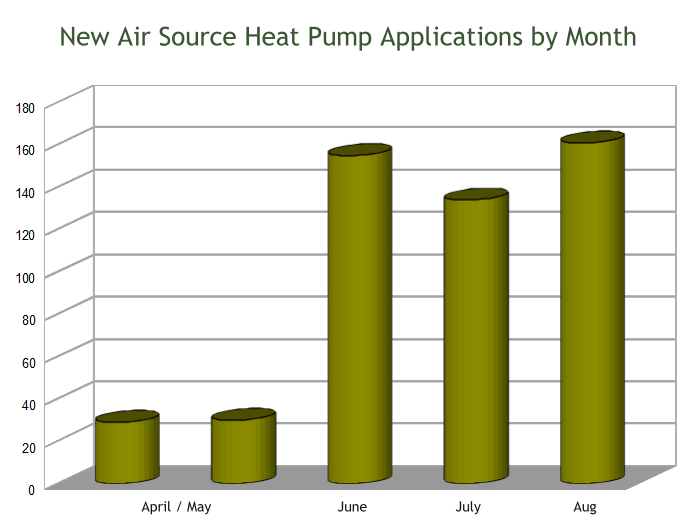 There have been 509 applications for new air source heat pumps since the launch of the scheme on July 9th. Air source heat pumps account for 32% of new applications making it the second most popular technology among new applications. Ground source heat pumps account for 106 new applications since the launch of the domestic RHI. This represents 7% of new applications and is significantly below the application levels for the other technologies. Both July and August, the most recent 2 months we have figures for, showed a sharp increase and between them account for 78 of the 106 GSHP installs. The early inactivity for ground source heat pump installations may be indicative of the lead time (from consideration, purchase through to completion) for this technology. 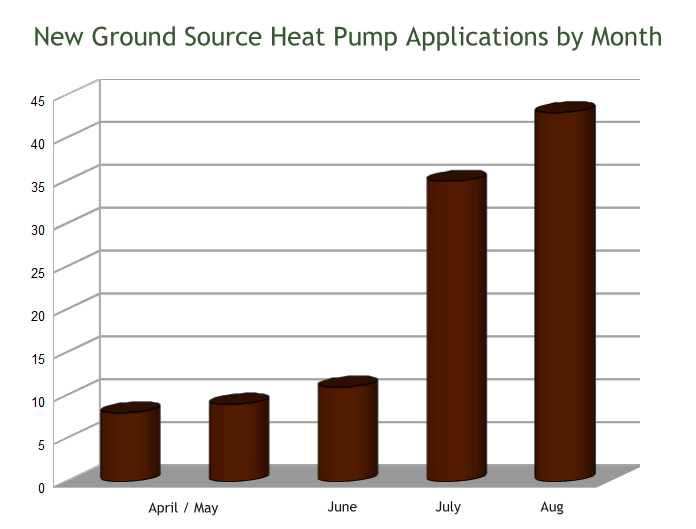 Ground source heat pumps accounted for 15% of installations under the RHPP (August 2011 to March 2014). It has been a slow starter under the Domestic RHI but we are likely to see it continue to improve in coming months. 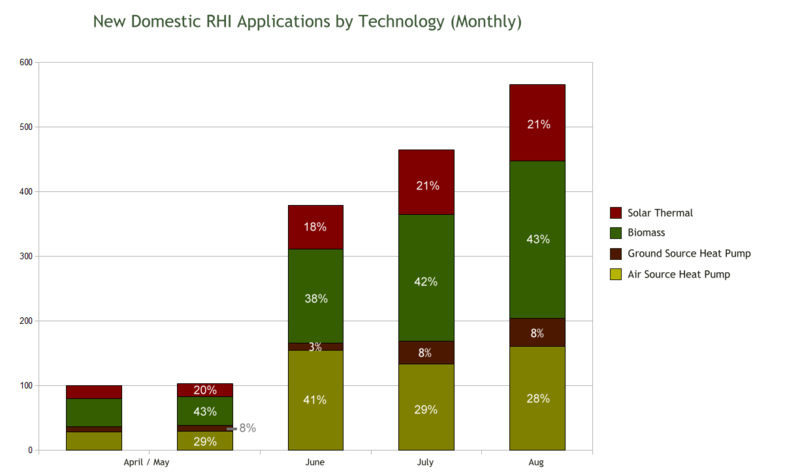 In August, biomass continues to be the most popular technology for new applications under the domestic RHI. There have been 671 applications for new biomass installations since the introduction of the scheme on April 9th. Biomass accounts for 42% of new applications, with air source heat pumps the next most popular at 32%. With 325 installations to date, solar thermal accounts for 20% of new applications since the launch of the Domestic RHI. This is lower than the 26% of legacy applications that are for solar thermal and down considerably on the 31% of installations solar thermal accounted for under the RHPP. Solar thermal installations are continuing to grow month on month though. For comparison, it is useful to look at installations under the Renewable Heat Premium Payment (RHPP). The RHPP ran from August 2011 to March 2014 in multiple phases and gives us an indication of domestic renewable heat installations during that period. 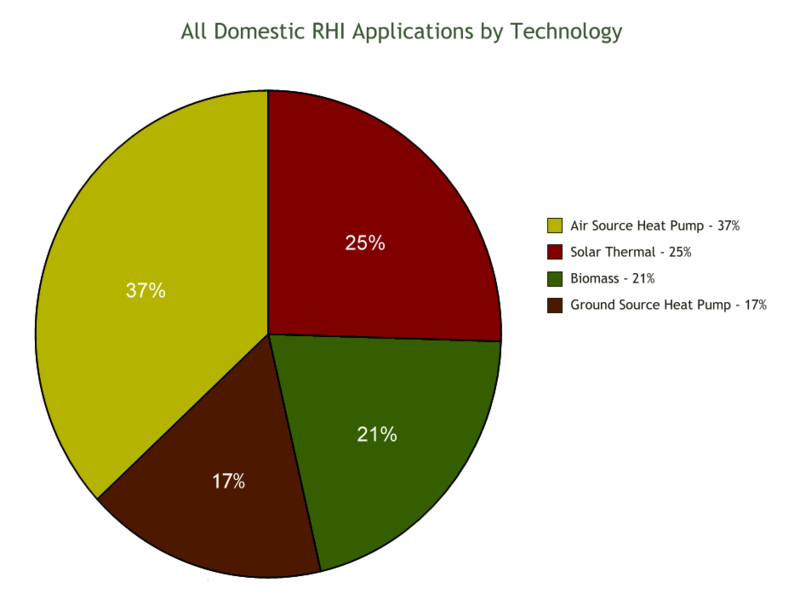 The vast bulk of Domestic RHI applications are legacy applications. Legacy applications are made for installations that were installed prior to the launch of the domestic RHI scheme (9th April 2014) but after its announcement on 15th July 2009. So they tell us more about what was installed over the last few years than about what is being installed over the last few months. They do however show the level of activity under the scheme and add to data on the last few years which can also be found in RHPP figures. We are more interested in applications since it eliminates the time lag of the accreditation process.